My grandmother always told me that Abacha is not a meal. Though it can be as filling as any other main course meal, African Salad is usually eaten as an in-between meal. I remember vividly how my grandma prepared Abacha as soon as she came back from the Eke or Afor market, garnished with a generous serving of garden eggs and the leaves, with some dry fish. Oh, I will never forget the long vacations spent at grandma's place. 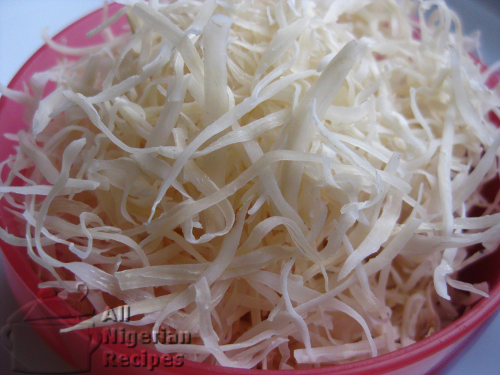 Abacha is prepared with cassava. The cassava tubers are cooked till done then sliced with a special grater. 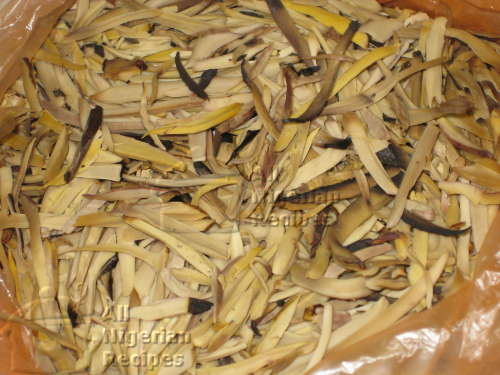 The sliced cassava is then soaked in cold water overnight, washed thoroughly and dried under the sun. Your African Salad will not be complete without Ugba. 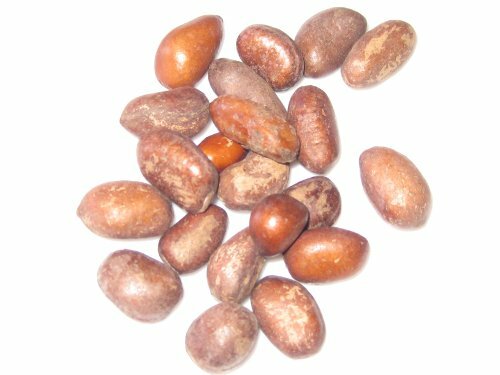 Ugba, also known as Ukpaka, is made from oil bean seeds. 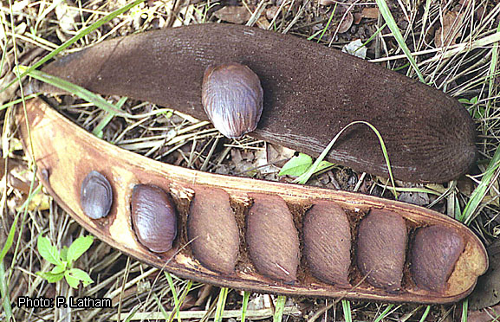 These seeds are cooked for several hours then sliced, washed and left to ferment a little bit. The following are the complete ingredients you need to make a delicious African Salad. I will group the ingredients for ease. I did not use all these in the video because they are not available where I live. Prepare the ehu seeds by roasting, peeling and grinding them with a dry mill. See this video for how to do that. If you will use kanda (cow skin), cook till done and cut into small pieces. Wash and cut the vegetables into tiny pieces. Cut the big bulb of onion into tiny pieces and cut the medium one in circles. Wash the garden egges and set aside, no need to cut these. The key to making a good African Salad is to make sure that all the ingredients are well incorporated. 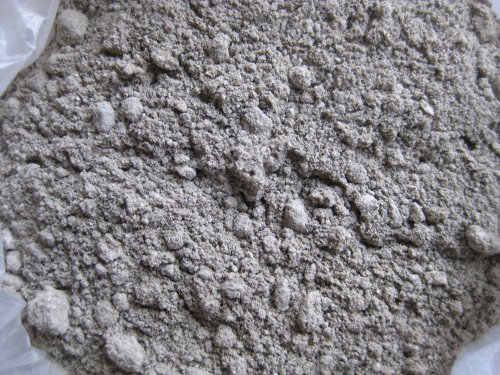 As you will see below, there's a lot of add this, stir, add that, stir. You may wonder why you can't just add everything and stir but if you do that, it will be very difficult for you to get a good blend of all the ingredients. Pour the palm oil into a sizeable pot. Yes you need all that oil so that your Abacha will not have a dry feel in the mouth when done. Pour the water from the potash mixture, making sure not to pour the sediments. Stir very well and you'll see the oil turn into a yellow paste. Add the ground pepper, ground ehu, crushed stock cubes, crayfish, diced onions and ugba (ukpaka), then stir very well. Please not that we are doing everything off the stove. Now add the soaked and drained Abacha and stir till it is well-incorporated in the palm oil paste. Add the sliced Utazi and salt to taste and stir well. 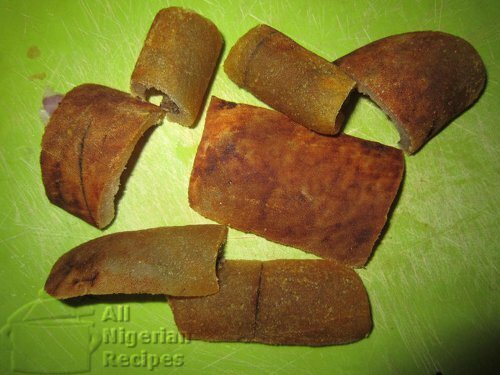 You can also use dry Utazi if the fresh one is not available where you live. It is important that you add salt last because after adding all that seasoning, your Abacha may not even need salt any more. Watch the video below to see how I did mine. 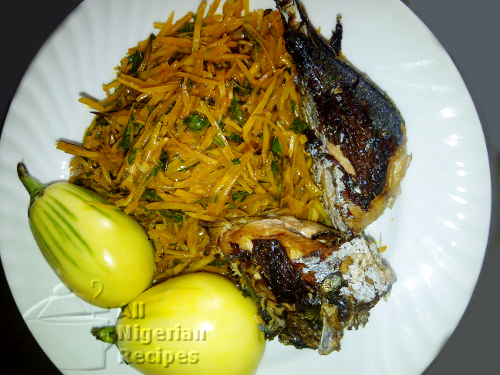 I used minimal ingredients but click here to see me make Abacha with all the possible ingrdients.